The MSI X320 notebook is a product that goes too far in imitating the MacBook Air (MBA). The comparisons are obvious from photographs showing up all over the Web. 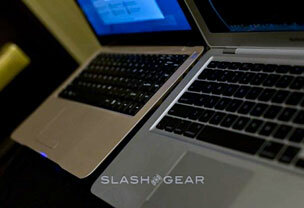 Slashgear has some of the better side-by-side photos showing the similarities, which are many. Tapering edges to give the illusion that the laptop is thinner. This is actually more necessary on the MSI X320, which is thicker than the MBA. Similar aluminum finish and light up logo on the lid. None of these features are the true mark of the Apple laptop. It's the hinge that opens the lid behind the computer that is distinctively Mac. Steve Jobs was so proud of this feature that he took a time to highlight it at the unveiling of the white iBook in 2001. That's how long it's been a trademark feature of every new Apple notebook. What makes the whole situation worse is that the MSI X320 is a cheap imitation. 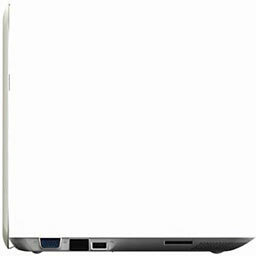 This notebook is thicker that the MBA, and the tapered edges looks ugly where MSI has placed multiple clunky ports. It also has a less powerful processor than the MBA, and other "wow" features like a multitouch trackpad are missing. Sure, copying the hinge isn't as bad as stealing the Apple logo or breaking the EULA to install Mac OS X, but it's not a good idea to steal the distinctive look of your competitor's product. Let's be honest: The PC world is full of hinge ideas, so there's no reason to copy Apple's distinctive design unless you do it deliberately. And if you do it deliberately, then it's to gain an advantage - and gaining an advantage at your competitor's expense is not exactly fair. That's not to say that there isn't a market for this notebook, but if it weren't trying so hard to look like a MacBook Air, it would be better. Time will tell if this imitator concerns Apple, as iMac lookalikes did in the past. Apple may sue just as a warning to others, or it may focus its attention on other issues. If I were MSI, I'd be praying that no one at Apple notices, because things could get ugly fast. BTW, you have to check out the video on the iBook. Back in 2001, Steve was very concerned to highlight how many outlets and optical drive choices were available for the iBook. Fast forward to 2009, and we see how Apple has left behind the need to show parity between its products and the competition. Hands-On with the MSI X320 Macbook Air Look-Alike, PC Magazine. "I don't want to call it a cheap knock-off, even though it is...."
Hands-On With the MSI X320, Laptop. "...we were pretty damn shocked when we laid eyes on the thinner than a rail 13-inch notebook. Think MacBook Air...."
Trade Dress, Wikipedia. "Trade dress refers to characteristics of the visual appearance of a product or its packaging (or even the facade of a building such as a restaurant) that may be registered and protected from being used by competitors in the manner of a trademark." Apple Announces Settlement & Victory in Suits Against iMac Knockoffs, Mac Observer. "In a settlement likely to have far reaching ramifications long into the future of corporate law , Apple has successfully leveraged the design of the iMac in trade dress infringement cases against Daewoo and eMachines."